Due to the increasing cost of fruit production in traditional agriculture (400-500 trees/Ha) and in order to raise the productivity per unit area, the global horticulture businesses had gone towards intensive farming adapting high density and later Super High-density planting (1000-1660 trees/ha). As per the strategic plan of Tabuk Agriculture Development Co. (TADCO), a field trial was conducted in 2009 and 2010 on six plums cultivars, three apricots cultivars, three round type shape and two flat type shape nectarines cultivars; and one flat type peaches cultivar. Most of these stone fruit cultivars originated from South Africa, three apricots cultivars from France and one plums cultivar from USA. Field observations of the research unit on the trial during the period 2010 to 2013 had shown vigorous trees growth, high yield and high quality of some cultivars under the influence of the selected rootstocks, good soil preparation with the deep ripping and reclamation of the soil after the addition of gypsum and sulfuric acid before planting. It had been noted that the selected rootstocks for the stone fruits cultivars were suitable in the calcareous alkaline salty soil except Mariana rootstock as we observed loss of the cultivars budded on this rootstock: 40% of Black Splendor plum, and 16% of Alba plum cultivar. All the rootstocks encouraged vigorous trees growth and did not reduce the size of the trees of the different cultivars to fit the intensive super high density planting system with the central leading system in plums, peaches and nectarines or the open center system (Vas shape) in apricots. The obtained results shown two plums cultivars Black Splendor, Pioneer and two nectarines cultivars Crimson Blaze, Royal Gem were suitable for Tabuk area. None of the tested apricots cultivars were suitable to this area. Super high density, Stone fruits cultivars, Central leader training system, Chilling hours, Rootstock. Due to the increasing demand for the consumption of healthy fresh fruits, cultivation of temperate fruit trees started in the regions of the northwest of Saudi Arabia mainly at Tabuk in 1983  and later at Al-Jouf and Hael regions due to suitable semi- Mediterranean climate, suitable soil for fruits production and availability of high water quality. As per the Saudi Agriculture Group (SAG) records  in 2007, cultivated areas increased rapidly over the years and reached over 1.887.215 fruit trees producing over 37030 M.T of fresh fruits including stone fruits, pome fruits, grapes and dates. Tabuk Agriculture Development Co. (TADCO) is one of the leading companies in Saudi Arabia in crops production of field crops, vegetable crops under centre pivot irrigation system and fruit trees thanks to professional business management, skilled production managers, and skilled labors. Over the years, TADCO gained the expertise to produce and market profitable fruit crops such as stone fruits, grapes, pears as they excluded the production of non-profitable fruit crops such as apples, almonds, figs, citrus, pomegranate and persimmon. As per TADCO records in 2010 , there were 805500 fruit trees planted in 650.9 Hectares which produced 13680 M.T fruits including 3600 M.T grapes, and these figures increased significantly in the last seasons. Horticulture Department started to import new cultivars of fruit trees & grapevines since the year 2001 to update the existing TADCO fruit trees cultivars; some of the imported cultivars were found not adapted to TABUK climate. To save the cost for the introduction of new cultivars, top management directed Fruits Business Unit (FRBU) and Research Department in coordination with Business Development Unit (BDU) in 2009 to test and evaluate more cultivars of fruit trees on small scale areas, and the successful marketable cultivars to be grown on large scale areas. The imported new cultivars of stone fruits were originated from the famous nurseries in Spain, South Africa & France such as Orero, Planasa, ARC, Escande etc. Peaches: Florida Star, Florida King, Desert Gold, Tropic Sweet, Hermicillio and Bonita. Nectarines: Armking, Maybelle, Sunred and 81-17N. Apricots: Sayeb, Kati, Canino, Bulida, Palastyn, Quardi and Amal. Plums: Santa Rosa, Royal Red, Black Beauty, Black Amber and Wicson. Peaches: Honey Blush (4.5 X 3 M), Plawhite, Flored and UF Gold. Apricots: A-35, Charisma and Super Gold. By the end of 2010 season, the board of directors directed TADCO top management to expand the cultivated area of fruit crops and grapes by planting current successful stone fruits and grapes cultivars into the vacant wheat pivots in the extension area. As a result of this decision, two pivots (80Ha) were planted in 2011 with different stone fruits cultivars of peaches, nectarines and apricots following circular planting rows with tree spacing 4.9 X 2 meters; another three pivots (120 Ha) were planted in 2011 with grapes cultivars following straight rows planting with tree spacing 3 X 2 meter. 1. To get new stone fruits cultivars adapted to Tabuk climate. 2. To get more early maturing cultivars and late maturing cultivars. 3. Fruits of the cultivars were desired by the end user. 4. Profitable new cultivars were characterized by high productivity & high quality with low chilling hours requirement. This object was achieved through adaption of new technologies on stone fruit trees cultivation & management. 1. Collect representative soil samples from depth 0–30, 30–60 cm & clods, then send to the lab for analysis. Results in Table 1 had shown that the soil texture is loamy with high salts level as the EC reached 36.6, 5.8, 16.70 mS/cm at the two depths & clods respectively. The level of sodium, chloride & bicarbonate salts was very high & not suitable for growing stone fruits trees; also, the level of calcium was high. Soil fertility was okay for potassium & magnesium, but phosphorous level was low. So, a plan was prepared for land preparation & reclamation of the soil before planting the trees as mentioned in the next steps. Sample Depth 30 - 50 cm. Table 1. Analysis of Soil Samples collected from Orchard 2, Blk. 16C before starting the fruits cultivars trial. 2. Scrap the soil surface to remove unwanted objects or trees to level the soil surface. 3. Deep cultivation in two directions to a depth of 90-120 cm using shank cultivator. The second cultivation was with an angle of 45° of the first cultivation. 4. Spread gypsum powder at the rate of 5 M.T./Ha. After the first chiseling to reclaim the soil from sodium salts. 5. Disc cultivation of the soil surface to break the soil aggregates followed by leveling using disc cultivator. 6. Design the irrigation lines, and then allocate the location of the trees in each line using lime marker in the direction of North to South. 7. Excavate the holes of 50 x 50 cm for the trees at a depth of 50 cm and at 150 centimeter distance. 8. Replace the excavated soil with a mixture of sand, soil, organic manure (1:1:½); add 100 gram NPK 14-38-10 granular fertilizer and place it at the bottom of the hole & mix it with the soil of each hole before adding the soil mixture into the hole. 9. Install dripper lines equipped with water drip outlet every 50 cm (7.5 liter/hour) and irrigate for one week to leach the salts before planting the trees. Plant the trees in each line at the proper depth in each hole and support the trees using wood stalk or wire lines to promote upright growth of the tree with a central leader. 10. Planting the stone fruit cultivars, each cultivar in one line, each line is planted with 30 trees/cultivar and the distance between the trees is 1.5 meters and 4.75 meters between the rows. 1. Training system: The Super High Density orchard training system [4,5] requires a trellis for central leader training. Most of the orchards use 2 - 5 wire lines along the planting line to support the trees tied with wood posts of 2.5 meters height along the row with one post every 30 meters. The young trees were tied to the wires every 40- 50 cm. and was not pruned in the first 2 years, except to maintain the central leader. At the end of the 2nd year, the lower 60 cm branches and any suckers were removed along with any excessive vigorous lateral branches that might interfere with the central leader. a) To support the trees straight upright development. b) To protect the trees from the stormy and strong wind coming in winter and summer. 2 - 5 wire lines were arranged along the tree row at proper heights 60, 120, 170, 210, 240 cm. respectively as shown in Figures 1 and 2 [4,5]. 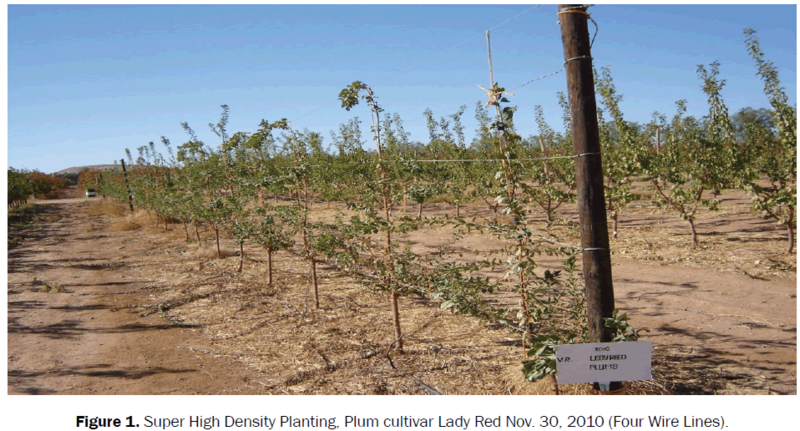 Figure 1: Super High Density Planting, Plum cultivar Lady Red Nov. 30, 2010 (Four Wire Lines). 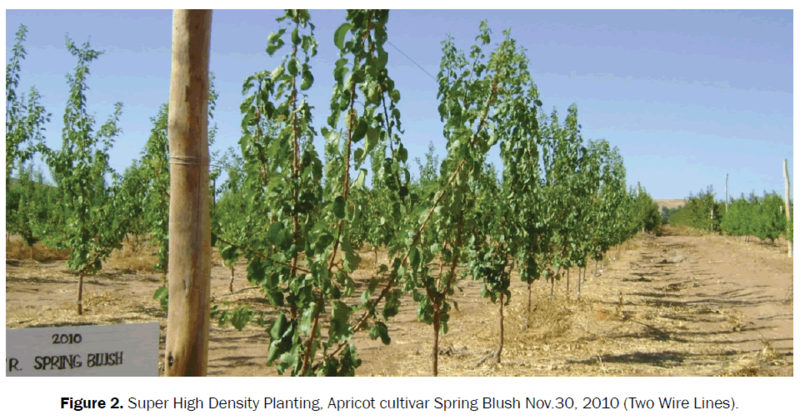 Figure 2: Super High Density Planting, Apricot cultivar Spring Blush Nov.30, 2010 (Two Wire Lines). To study the interaction of the rootstock with budded cultivar & tree shape: Different rootstocks were included in the new cultivars trial. The desired rootstocks are with low to medium chilling hours requirements and should confer compatibility with the budded cultivars. Selection of these rootstocks was based on their tolerance to soil conditions such as wet soil after heavy rain, salts and drought, resistance to root knot nematodes & soil fungi. The selected cultivars/rootstocks are shown in Table 2. Table 2. List of selected cultivars/rootstocks planted in 2009 & 2010 seasons. a. Latitia cultivar, Line 4A: tree # 1, 9, 16, and 21.
b. Saphire cultivar, Line 6B: tree # 7, 13, 17, and 21.
c. Pioneer Cultivar, Line 4B: three trees in between Gamonal trees. Cadaman: The origin of this rootstock is France, and it is widely used in Europe. It is a hybrid between peaches Prunus persica and the Chinese peaches Prunus davidiana. It is characterized by green leaves color. Cadaman rootstock is a patented Hungarian French-bred vegetative peach. It is drought resistant, resistant to wet soil (asphyxia), medium tolerance to chlorosis, suitable for growing in all types of soils including clay soil. It is resistant to root knot nematodes, but susceptible to the lesion nematodes, partially resistant to crown gall Agrobacterium bacteria, Armillaria and Rosellinia fungi. High cropping efficiency and vigor with peach and nectarine cultivars under Mediterranean climatic conditions. It is suitable as rootstock for peaches, Nectarine, Almond & plum. It can be propagated by green cutting or wood cutting or tissue culture. GXN 15 (Garnem): The hybrid progeny (GxN) is a cross of Garfi Almond (Prunus amygdalus) with Nemared peaches (Prunus persica). It is characterized by red leaves, easy propagation & good nursery performance. It is compatible with peaches, Nectarine, Almond & some plum cultivars. This rootstock is adapted to calcareous soils, resistance to lime-induced chlorosis & water deficiency, trees budded on this rootstock are significantly with higher vigor than trees budded on peach seedling rootstocks, performs well in replant situations. Fruit production slightly higher, it is with broad resistance against root knot nematodes including M. arenaria, M. incognita, M. javanica, and M. hispanica; In addition, it is resistant to crown gall. However, it is susceptible to the lesion nematode, Agrobacterium bacteria, Armillaria and Rosellinia fungi. Myrobalan 29C: It is originated from the Chinese peaches. It is easily propagated by micro propagation, and it is compatible with plum cultivars & some apricot cultivars. Usually well anchored, but somehow shallow with vigorous root system, prone to suckering. It is a good choice for hard soils. It is resistant to wet soil (asphyxia), and somehow drought tolerant, tolerant to chlorosis. It is immune to root knot nematodes and susceptible to the lesion nematodes, moderately resistant to crown gall Agrobacterium bacteria & Armillaria fungi. It is with good vigor performance, not considered a dwarfing rootstock and do not effect on ripening periods. It is not used or recommended for commercial peach plantings, normally, unless wetter poorly drained soil conditions warrant. Mariana G.F. 8-1(P): Virus free clone rootstock obtained in France by INRA. It provides high vigor to the cultivars and it provides homogeneity, affinity and size to the fruit. It is the most resistant rootstock for root asphyxia for trees with superficial roots. It has proven resistance to the roots parasitic fungi (Armillaria & Rosellinia), and also resistant to root knot nematodes. It adapts to all types of soil: sandy, lime and clay. We get agronomic information on some of the different cultivars from the nurseries suppliers [6,9,10] as shown in the following Table 3. Table 3. Agronomic information on some of the different cultivars from the nurseries suppliers. Daily operations for the trees maintenance were carried out by the FRBU Orchard 2 Supervisor and operations personnel to manage the trees needs in reference to trees age, stage of trees development, season, weather conditions: this included irrigation, fertilizer application, pests, disease & weeds control, training and pruning the trees to fit central leader shape & support the trees with the wire lines. Research Unit record their observations on blooming, fruits setting, date of maturity of each cultivar, incidence of pests, diseases & nutrients deficiencies. Records on the yield kg/tree were taken from the FRBU harvest records of Orchard 2. - Compatibility of the rootstock with the budded cultivar. - Reasonable reduction of the tree size under the effect of the rootstock to fit Super High Density planting system. - Resistance of the rootstock to root knot nematodes & soil diseases. - Tolerance of the rootstock to salt & drought conditions. - Suitability of the rootstock to the soil type of the orchard. - No difference in the chilling hours requirements between the rootstock & the budded cultivar. - Date of blooming & Fruit setting. - Trees vigor and productivity. - For early cultivars it was desired to start production by the mid of April. - Fruits quality are good externally & internally and desired by the end user. Quality is a combination of attributes that give value in terms of human food. Factors affecting stone fruits quality [11,12] are shown in the following Table 4. Table 4. Factors affecting stone fruits quality. As fruit matures and ripens, color changes from green to red or yellow dependent on the cultivar; also, the flesh color changes to red or yellow according to the cultivar. Changes in background color of the fruit are not affected by the sunlight, and thus it is a measure more dependable on maturity. However, this test is less effective on some of the newer cultivars that have been bred to appear well colored. The red pigmentation obscures the background color change. Although skin color is probably the most common method of assessing fruit readiness to harvest, it is not considered the most accurate indicator of maturity. However, experienced growers often use background color as a means of assessing harvest maturity of peaches and nectarines. Excessive quantities of nitrogen can have a deleterious effect on skin color as well as internal/keeping quality. Attaining a specific size is one index of maturation, but it cannot be used alone since fruit size for any one cultivar may be influenced by crop load, climatic conditions, and cultural practices. Fruit shape or fullness of cheeks indicates maturity. When fruit shoulders and suture are well developed and filled out coupled with complete color, stone fruits are considered mature. Total Soluble Solids (TSS), is a measure of the sugar, organic acid and other soluble components in the juice of the fruit. TSS is measured using a refractometer to determine the percentage of pure sucrose; the major constituent in fruit juice is expressed as °Brix. Cultivar and cultural practices affect TSS; TSS% is important because it tells you when the fruit is sweet enough to eat. It can be used with other indices, such as firmness. Flesh firmness can be a very good indicator of maturity. This also relates closely to the eating experience for the consumer. Peaches harvested with pressure readings too high will generally display a dry, mealy texture when consumed. Stone fruit firmness is affected by cultivar, crop loads, nutrition, pruning and seasonal conditions. Flesh firmness is measured using a penetrometer with an 11-mm diameter plunger. The resistance required to drive a plunger though the flesh measured in kilograms or pounds. Growers and shippers are concerned about good appearance and few visual defects, but to them a good cultivar must score high on yield, disease resistance, ease of harvest and shipping quality. To receivers and intermediate handlers, qualities of appearance and firmness are important as well as long storage life. Consumers see good quality as good appearance, firmness, good flavor, and nutritive value. Although consumers buy on the basis of appearance and feel, satisfaction and subsequent purchase depend on good eating quality. Productivity of Stone Fruits cultivars was affected by the following local climatic factors: number of chilling hours, frost injury in spring, incidence of heavy rainfall, and the incidence of sandstorm during the blooming & fruit setting. Number of chilling hours: It is the most important factor limiting the productivity of stone fruits cultivars in a particular growing area as the trees need to experience the required chilling hours during dormancy period to produce normal crop. TADCO succeeded growing early stone fruit cultivars with low chilling hours requirements of 200-300 hours in addition to cultivars with medium chilling hours requirements 300-500 hours. Stone fruit trees enter the stage of dormancy during the autumn & winter months . During dormancy, the trees stops growing and the buds do not open until the trees experience the required chilling hours of temperatures range 0-7.2°C (32-45°F). The trees could stand temperatures below zero during the dormancy period without any damage to the trees since they are dormant. If the trees did not receive the required number of chilling hours it will not produce normal crop. The symptoms of chilling hours deficiency are manifested into: many buds are killed & fall down, delay in blooming, inconsistent blooming and the flowers may experience unsuitable conditions during pollination period like high temperature, and irregular or delay in the leaves cover of the trees, so the branches shall appear free from leaves with less & short branching and short spurs as shown in Figures 3A and 3B. Figure 3: (A) Symptoms of chilling hours deficiency on Plawhite Peaches and (B) Viowhite Nectarine at Orhard 2 in March 2010. The number of chilling hours shown in Table 5 and Figure 4 varied in each year, and it was cold years in 2007, 2008, 2012 and this may have affected the yield negatively in case of the onset of spring frost. In the other hand the productivity increased in the years with moderate number of chilling hours such as 2011 & 2013 in conjunction with Dormex application. Figure 4: shows the curves for the number of chilling hours during the years 2007 – 2013. Sudden heavy rainfall: Sudden heavy rainfall may affect dormancy, the trees health & productivity as we observed when heavy rain (42.5 mm) occurred in January 18, 2010 in less than 24 hours during dormancy. This caused break of dormancy in stone fruits trees earlier than expected leading to early fruit setting & start early harvesting stone fruit crops three weeks earlier, but the productivity was 50% less than normal years. 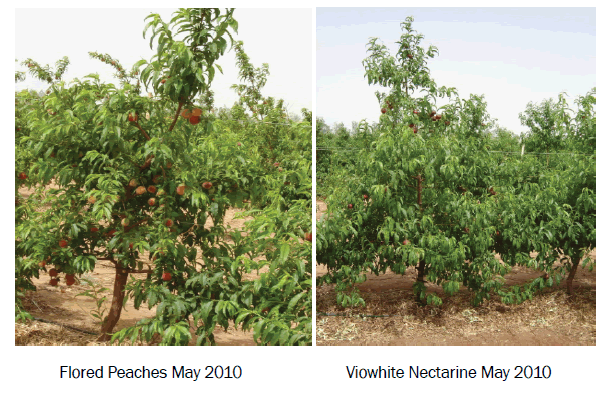 The combined effect of heavy rainfall & inadequate chilling hours on peaches Plawhite & Nectarine Viowhite at Orchard 2, Blk 15 on March 2010 is shown in Figure 3A and 3B. Frost injury in spring: We observe every year frost damage in the spring months on late blooming cultivars of plum and early grapes cultivars as it occurred on March 18, 2010 & March 19, 2012. In the spring of 2012, there was significant effect of spring frost damage on stone fruits cultivars manifested into low productivity per tree and the load of the tree was concentrated on the tree tops while low branches of the trees was with less or nil productivity. Incidence of sand storms: The incidence of sand storms during the blooming & fruit setting affects the productivity of fruit trees. Sand storm with warm air blown from the Sahara of North Africa on March 15, 2013 caused damage on the pollination & fruit setting of fruit trees and this effect was observed at TADCO orchards on late pollinated plum cultivars like Saphire and on pears cultivar Ercolini. The growth rate of the trees over the period 2010- 2011 varied from good to very good dependent on type of: fruit crop, rootstock, and the interaction of the rootstock with the scion and the training shape. Summary on the status of the stone fruits trees trial at Blk 21C during 2010 season are shown in Figures 5, 6 and Table 6. 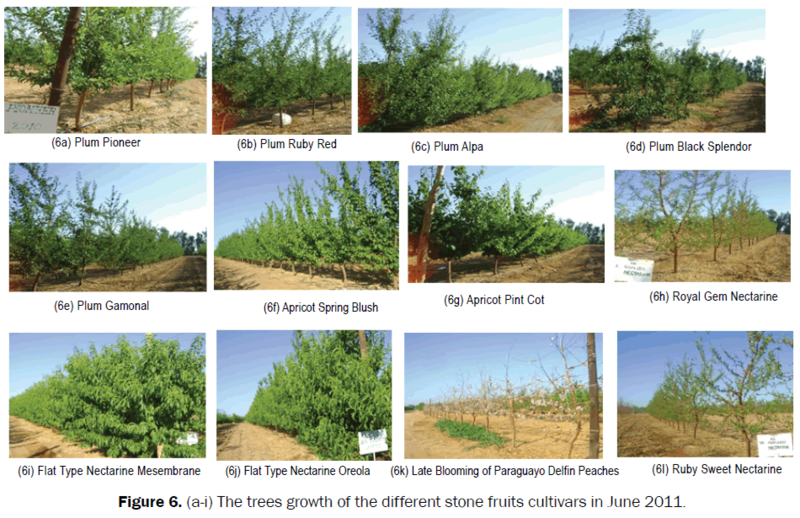 Figure 5: (a–h) The trees growth of the of the different stone fruits cultivars in June 2010. Figure 6: (a-i) The trees growth of the different stone fruits cultivars in June 2011. Table 6. Summary of the observations results on the different stone fruits cultivars in June 2010. Summary of the observations results on the different stone fruits cultivars in June 2010 are shown in the following Table 6. Trees were allowed to grow during 2010 with minimum pruning and most of the trees shown vigor growth during the summer months; the trees training shape was not decided yet. In 2011, most of the trees shown vigorous growth, and the trees shape in Plum, Nectarine & peaches cultivars were with central leading shape, while in Apricot cultivars were in open vase shape as shown on Figures 5 and 6. Incompatibility: It refers to the ability of the scion and the rootstock to form a functional long-term graft union, complete fusion of the adjoining cambial tissues is critical for effective translocation of water, nutrients and growth regulators. Areas that do not join shortly after grafting never fuse and such gaps leave weak points that provide sites for invasion by various pests and disease-causing agents. Four trees of plum crop, cultivar Gamonal shown incompatibility of the scion with the root stock GF 8-1 as shown in Figure 7; also one nectarine tree, cultivar Ruby sweet shown incompatibility with GXN 15 rootstock. 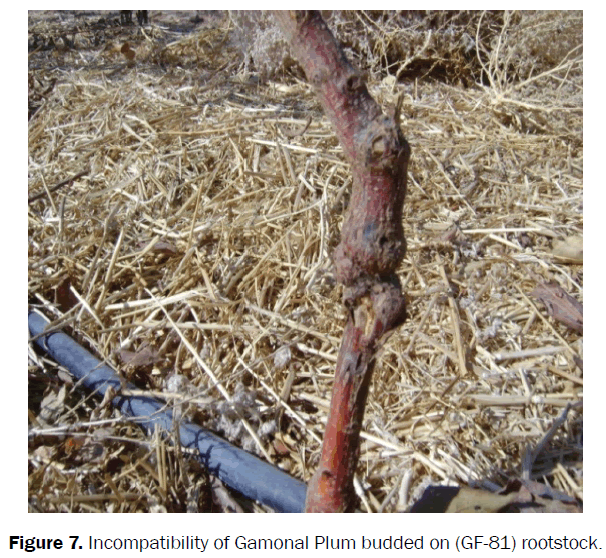 Figure 7: Incompatibility of Gamonal Plum budded on (GF-81) rootstock. 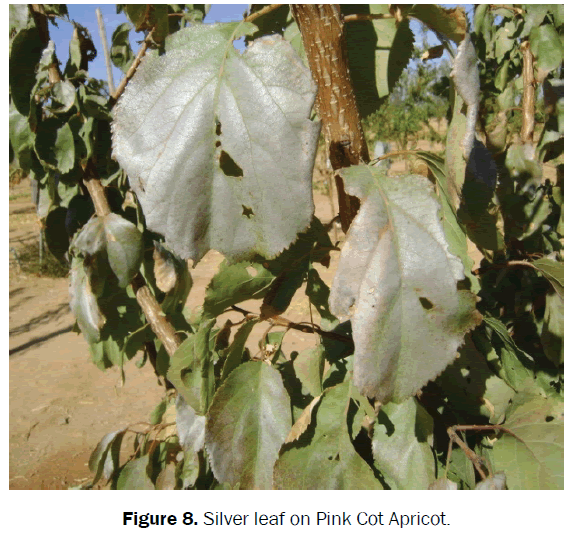 Silver leaf: We observed the appearance of silvery leaves on Black Splendor Plum & Pink Cot Apricot on November 2011 as shown in Figure 8. The cause of this disease is the fungus Chondrostereum purpurem [14,15]; this is a serious disease on stone fruit trees if not controlled. Following the appearance of the silvery sheen on the leaves, the affected branches died. When the branches are cut across, an irregular dark stain may be seen in the Centre. The application of copper fungicides such as Kocide during dormancy stopped the appearance of this disease in the following years. Figure 8: Silver leaf on Pink Cot Apricot. (12) Trees of Black Splendor Plum & five trees of Alpa Plum: both cultivars are budded on Mariana plum rootstock. (2) Ruby Red Plum trees budded on GXN-15 rootstock. (2) Pink Cot Apricot trees budded on Myrobalan 29C rootstock. (1) Tree on each of the cultivars: Lady Red Plum & Ruby Sweet Nectarine. Incidence of gummosis disease: It was observed gum exudates at the trunk base of Black Splendor Plum Cultivar Figure 9. Gums are complex polysaccharides that are normally found in the vascular bundles of the plant parts [15,16], the color of the gum varies: white, amber or brown. Gummosis occurs due to stresses caused by environmental conditions or organism attack on the plants, the gum become hydrated and causes the bundles to rupture. When this happens, the gums accumulate in pockets or are exuded through weak points in the tissue. Most stone fruit diseases show gum deposits on the infected plant parts such as the bark surface or buds or fruits. 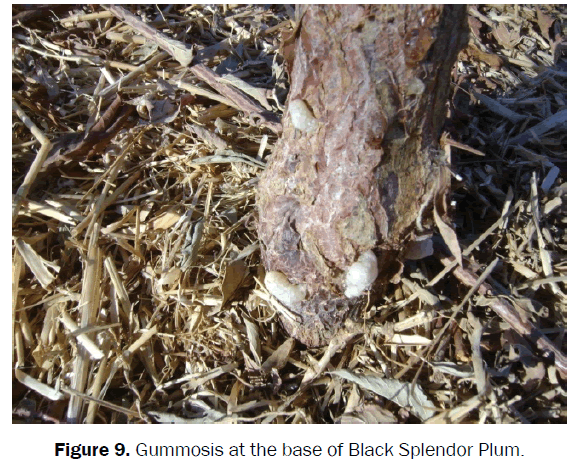 Figure 9: Gummosis at the base of Black Splendor Plum. The application of copper fungicides such as Kocide during dormancy protects the trees from damages of this disease. Incidence of crown gall: It was observed at the trunk base of Black Splendor Plum & Pink Cot Apricot Figure 10. Crown gall is an abnormal outgrowth on roots or trunk near ground level of fruit trees, sometimes it is found on the trunk and main scaffolds. The cause of this disease is Agrobacterium tumifaciens bacteria [15,16], usually it enters the roots through the wounds caused by machinery during cultural practices or wounds caused by soil insects or nematodes. Initially galls are creamy colored and soft, become roughened and crack as they get older. Tops of severely affected trees are weak and stunted, leaves are pale in color, tinted with red, then leaves fall and tree will die. Old trees may develop secondary fungus wood rots with weekend limbs above diseased area. The development of galls can occur in a few weeks or a few years depending on various environmental factors including host & temperature. 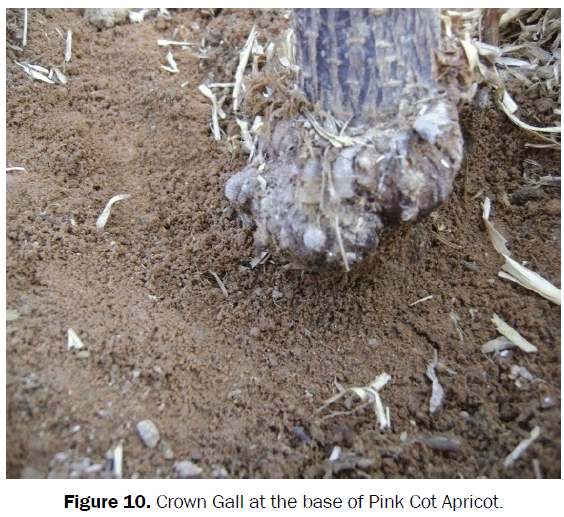 Figure 10: Crown Gall at the base of Pink Cot Apricot. The pathogen spreads from the contaminated soil to new sites and plants by irrigation water, tools, wind, insects and plant parts used for propagation, and it survive in the soil indefinitely. Control: Avoid planting infected plant material and use disease-free seedlings. Soak the trees roots before transplanting in a solution of the biological agent Agrobacterium radiobacter. 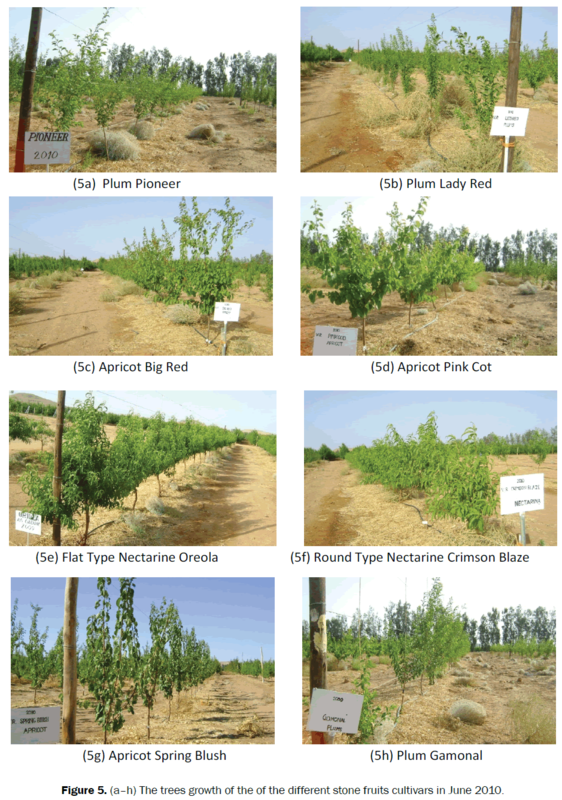 The most consistent plant characteristics and performance as observed in the Super High Density Trial of Stone Fruits crops in 2011 & 2012 are described in the following text. Plum crop is the most extensively distributed of the stone fruits crops, most varied in native and cultivated kinds, and most adapted to a wide range of soils and climatic conditions . Plum flowers belong to the Rosaceae family which has simple five petals. The fruits show a wide range of size, flavor, color, and texture. They are widely eaten fresh, cooked, or baked in pastries. In full bloom, plum trees are covered with densely packed, showy flower clusters. The smooth-skinned fruit has a fleshy, juicy exterior and a hard interior stone or pit. Plum cultivars that can be or have been dried without resulting in fermentation are called prunes. Plums fruits are contributors of food energy, and have the potential to contribute greatly to human nutrition because of their richness in fibers, minerals, antioxidants and vitamins such as A and C.
Small size fruits: ≤ 49 mm. The color of plum fruits can be yellow, green, red, and purple. Plum according to their origin can be divided into two categories: Japanese and European. Japanese plum (which actually originated in China) is the larger of the two and has a juicier, softer flesh. European plum is good eaten fresh but is particularly well suited to drying and cooking. The major factors limiting the shelf life of plums [11,12] are softening (overripe), fungal decay, reduced flavor quality (too low acidity, no aroma) and less favorable appearance (lack of freshness, shriveling or bruising). New cultivars should have fruits that stay firm during marketing and resistant to fungal diseases and have a fresh appearance; they should also have good flavor even after several weeks in the marketing chain. Summary on the comparative quality parameters of the observed plums cultivars in 2011 and 2012 are shown Table 7. *Clingstone refers to a drupe having a stone, which cannot easily be removed from the flesh. The flesh attached strongly to the stone and must be cut to free the stone. Table 7. The comparative quality parameters of the observed plums cultivars in 2011 and 2012. Black splendor plums: 30 trees of this cultivar budded on Mariana rootstock were planted in 2009. It started production in 2011; dates of blooming, fruit setting & harvesting are shown Table 8. Table 8. Observations on Black Splendor cultivar in 2011 and 2012 cropping seasons. Low chilling hours requirement ≤ 300 hours. The skin color is Blue/Black with mahogany color on the shoulders. Fruit oblate, medium size and the flesh color is beet red when it ripe Figure 11. Eating quality is good with a tart flavor; %TSS range 13.5-15.6. Early maturing cultivar by the end of May, harvesting started two weeks before Saphire, one month before Black Diamond, & 40 days before Laetitia & Larry Anne plums cultivars grown at TADCO. Trees growth on Mariana rootstock is suitable for Super High Density planting. Observed suckers growth of (3-10)/tree grown from Mariana rootstock. Observed some gum exudates on the trunk. The comparative quality parameters for Black Splendor fruits are shown in the quality Table 7. 30 trees of this cultivar budded on GF - 81 rootstock were planted in 2009. We arranged three Pioneer trees in between the raw as pollinators. It started production in 2011; dates of blooming, fruit setting & harvesting are shown in Table 9. Table 9. Observations on Gamonal cultivar in 2011 and 2012 cropping seasons. i. Low chilling hours requirement. ii. The skin color is black to red when it ripe. iii. Fruit size is large and the flesh color when it ripe is yellowish green Figure 12. Figure 12: Gamonal Plums Fruits. vi. Harvesting started three weeks after Black Splendor & Pioneer, it was harvested on June 27 in 2012. It was similar with the harvesting dates of Saphire, but 28 days before Laetitia, Larry Anne & Black Diamond plums cultivars grown at TADCO. vii. No Suckers come from GF 8-1 rootstock. viii.Observed some gum exudates on the trunk. ix. Observed three trees are with Incompatibility between rootstock & scion. The comparative quality parameters for Gamonal fruits are shown in the quality Table 7. 30 trees of this cultivar budded on GF 8-1 rootstock were planted in 2010. It started production in 2011 with little yield. Dates of blooming, fruit setting & harvesting are shown in Table 10. Table 10. Observations on Pioneer cultivar in 2011 and 2012 cropping seasons. ii. The skin color is yellowish with partial red color. iii. Flesh color when it ripe is light yellow Figure 13. Figure 13: Pioneer Plums Fruits. vii. Harvesting started early: two days after Black Splendor, it was harvested two weeks before Saphire, 24 days before Black Diamond, 38 days before Laetitia & Larry Anne. viii. Observed suckers growth (2-5)/ tree comes from GF 8-1 rootstock. ix. Observed high gum exudates on the trunk and major branches. The comparative quality parameters for Pioneer fruits are shown in the quality Table 7. 30 trees of this cultivar budded on GXN-15 rootstock were planted in 2009. It started production in 2011 with low yield, and productivity was low in 2012 due to spring frost occurred on March 19 which affected the flowers. i. Cross pollination with Saphire cultivar. ii. Starting flowering in February 20, 2011, when the accumulation chilling Hours is equal 348.
iii. Started fruit setting on April 4, 2011.
v. The fruit skin color is red, and the flesh color is yellowish when it ripe Figure 14. Figure 14: Ruby Red Plums Fruits. viii. Late maturity cultivar as harvesting started on July 16, 2011 which was one week before Laetitia & Larry Anne, five days after Black Diamond, and two weeks after Sapphire cultivars grown at TADCO. ix. No suckers came from the rootstock. x. Observed some gum exudates on the trunk and major branches. The comparative quality parameters for Ruby Red fruits are shown in the quality Table 7. 30 trees of this cultivar budded on Mariana rootstock were planted in 2009, it started productions in 2011 with little yield, and no productivity in 2012 due to spring frost on March 16 which affected flowers. ii. Started flowering on March 10.2011, When the accumulate chilling hours is equal 320.
iii. Started fruit setting on April 4.2011.
v. The skin color is pinkish, and the flesh color when ripe is yellowish Figure 15. Figure 15: Alpa Plums Fruits. viii. Late maturity variety as harvesting started on August 13 which is 20 days after Laetitia, 30 days after Black Diamond & Larry Anne and 45 days after Saphire. ix. Observed some suckers (1-3)/tree comes from Mariana rootstock. x. Observed some gum exudates on the trunk. The comparative quality parameters for Alpa fruits are shown in the quality Table 7.
ii. No suckers come from rootstock. iii. Observed some gum exudates on the trunk. v. The skin color is red blush. vi. Flesh color when it ripe is yellowish. TSS% reach 15. Nectarine trees produce sweet fruits  that is not only delicious but it is a nutritious source of antioxidant, vitamins such as A and C, and they are a good source for potassium and a contributor of food energy. Nectarines can be used in the same way as peaches. Genetically, the only difference between peaches and nectarines is the lack of fuzz on the skin of nectarines. Nectarines are usually a little smaller than peaches, have more aromas, and have more red color on the skin. Nectarines are mostly self-pollinating trees, which mean that a single nectarine tree can pollinate itself. Nectarine trees are fast growing and most will begin to produce fruit in 2 to 3 years after planting under TADCO conditions. Large size fruits: ≥ 67 mm. Medium size fruits: 56-66 mm. Small size fruits: 55 mm or smaller. The comparative quality parameters  of the observed Nectarines cultivars are shown in the following Table 11. 30 trees of this cultivar budded on GXN-15 rootstock were planted in 2010, it started production in 2011. Dates of blooming, fruit setting & harvesting in 2011 and 2012 cropping seasons are shown in the following Table 12. Table 12. Date of blooming, fruit setting & harvesting in 2011 and 2012 cropping season. ii. Fruit color is Pinkish and the flesh is yellow green when it ripe Figure 16. Figure 16: Royal Gem Nectarines fruits. iii. The stone is Clingstone. v. Harvesting started late in mid of May. It is harvested one month after the harvesting date of Viowhite. vii. Observed small gum exudates on the trunk. viii. Observed suckers growth 1-3/tree comes from GXN-15 rootstock. ix. The quality parameters for Royal Gem fruits are shown in the quality Table 11 of Nectarines cultivars. 30 trees of this cultivar budded on GXN-15 rootstock were planted in 2010. It started production in 2011. Dates of blooming, fruit setting & harvesting are shown in the following Table 13. Table 13. Date of blooming, fruit setting & harvesting. i. Medium chilling hours requirement. ii. Fruit color is Pinkish, and the flesh color is yellow when it ripe Figure 17. Figure 17: Ruby Sweet Nectarines Fruit. v. Medium maturity cultivar as harvesting started by the first week of May 10 days after harvesting date of Viowhite. vi. Observed small gum exudates on the trunk. vii. Observed some suckers growth of 1-3/tree comes from GXN rootstock. viii. The comparative quality parameters for Ruby Sweet fruits are shown in the quality Table 11. 30 trees of this cultivar budded on GXN-15 rootstock were planted in 2010. It started production in 2012. Dates of blooming, fruit setting & harvesting are shown in the following Table 14. Table 14. Date of blooming, fruit setting & harvesting. i. Fruit color is Pinkish and the flesh color is yellow to orange when it ripe Figure 18. Figure 18: Crimson Blaze Nectarines fruits. ii. TSS% range is low 8-10.
iv. - Late maturing cultivar, harvesting started one month after the harvesting date of Viowhite. v. Observed small gum exudates on the trunk. vi. Observed suckers growth of 1-3/tree comes from GXN rootstock. viii. The comparative quality parameters for Crimson Blaze fruits are shown in the quality Table 11. 30 trees of flat type Mesembrane Nectarine budded on Garnim rootstock were planted in 2009, there was little production of fruits of bad quality in 2011 as shown in Figure 19, and no production in 2012 due to frost on March 19, 2012. Figure 19: Flat Type Fruits of Mesembrane Nectarines. i. Started flowering on Feb 25, 2012 when the accumulative chilling hours reached 606 and continued until after mid of March. ii. There was no fruit setting in 2012 season due to frost on March 19.
iii. Observed suckers growth of 5-10/tree coming from Garnim root stock. 30 trees of flat type Mesembrane Nectarine budded on Garnim rootstock were planted in 2009. There was no production in 2011 and 2012.
i. Started flowering in March 5. When accumulative chilling hours reached 701 and continued until March 25, 2012.
ii. There was no fruit setting in 2012 due to frost on March 19.
iii. Observed suckers growth of 7-13/tree coming from Garnim rootstock. 30 trees of this cultivar budded on Cadaman roots tock were planted in 2009.
i. The tree growth was moderately vigorous with semi-spreading growth habit. ii. It was with late blooming as it bloomed on March 18 until April 4, 2011, 2012 (Figure 20A) when the accumulative chilling hours reached 354, 723 in 2011 and 2012 seasons respectively with non-homogenous flowering. Figure 20: (A) Peaches Paraguayo Delfen with late blooming on April 4, 2011, (B) Peaches Paraguayo Delfen with suckers came from the Cadaman rootstock. iii. No fruit setting in 2011 and with small fruits setting in 2012 an indication of long chilling hours requirement. iv. Observed too much suckers growth comes from Cadaman rootstock Figure 20B. v. Fruits are flat type. Fruit of the tree Prunus armeniaca, in the rose family, cultivated generally throughout the temperate regions of the world and used fresh [14,15], cooked in pastries, or preserved by canning or drying. Apricot trees are large and spreading, with heart-shaped, dark green leaves. Flowers are white. The fruit is nearly smooth and generally similar to the peach in shape but with little to no hairiness when ripe. Apricots are a contributors of food energy, and a good source of vitamin A and are high in natural sugars. In addition, dried apricots are a valuable source of iron and calcium. The species is genetically diverse and can grow in a wide range of climates depending upon the cultivar. Most commercial production in the world is limited to areas where temperatures do not fall below -10 to -22°C for extended periods; however, certain cultivars can tolerate sever conditions. Many apricot cultivars can tolerate high summer temperatures in excess of (40°C). Some cultivars develop an internal browning of the flesh if high temperatures persist with fruits on the trees. Apricot trees tend to bloom earlier than other stone fruit and are sensitive to frost. Frost-free areas are generally preferred. Large size fruits: ≥ 56 mm. Medium size fruits: 45-55 mm. The comparative quality parameters of the observed apricots cultivars  are shown in the following Table 15. *Freestone refers to a drupe having a stone, which can be removed from the flesh with ease. The flesh is not attaching to the stone and does not need to be cut to free the stone. Freestone cultivars of fruits are preferred for uses that require careful removal of the stone, especially if removal will be done by hand. Table 15. Comparative quality parameters of the observed apricots cultivars. 30 trees of this cultivar budded on Myrobalan 29C rootstock was planted in 2010; it started with little fruits production in 2011. Dates of blooming, fruit setting & harvesting are shown in the following Table 16. Table 16. Date of blooming, fruit setting & harvesting. i. Meduim chilling hours requirement. ii. The skin color is pinkish and the flesh color when ripe is yellowish Figure 21. Figure 21: Apricot fruits of Spring Blush cultivar. iv. Harvest started by the first week of May in 2011 & 2012. It is 6 days after the harvesting date of the early apricot cultivar A-35, & two weeks before Canino and Charisma. v. Very low productivity, average productivity/tree in 2011 & 2012=0.23 kg, and no productivity in 2013.
vi. Some suckers (1-3)/ tree appeared on the base of the rootstock. vii. No gum exudates on the trunk. viii. The quality parameters for Spring Blush fruits are shown in the quality Table 12. 30 trees of this cultivar budded on Myrobalan 29C rootstock was planted in 2010; it started production of few fruits in 2011. Dates of blooming, fruit setting & harvesting are shown in the following Table 17. Table 17. Date of blooming, fruit setting & harvesting. ii. The skin color is Pinkish and the flesh color when ripe is yellowish Figure 22. Figure 22: Big Red Apricots Fruits. v. Low productivity 2.98 kg/tree in 2012 and 5.5 kg/tree in 2013. It was harvested 9 days after Spring Blush and two weeks after the early apricot cultivar A-35, and at the same time with Canino and Charisma apricot cultivars grown at TADCO. vi. No suckers appeared on the rootstock. vii. No gum exudates appeared on the trunk. viii. The quality parameters for Big Red fruits are shown in the quality Table 12. 30 trees of this cultivar budded on Myrobalan 29C rootstock was planted in 2010. It started production of few fruits in 2011. Dates of blooming, fruit setting & harvesting are shown in following Table 18. Table 18. Date of blooming, fruit setting & harvesting. ii. The skin color is pinkish and the flesh color when it ripe is yellowish Figure 23. Figure 23: Pink Cot Apricots Fruits. iv. Very low productivity, average productivity/tree in 2011 & 2012=0.05 kg/tree, and no productivity in 2013.
v. Late harvesting on May 19. It is harvested 9 days after Spring Blush and two weeks after the early apricot cultivar A-35, and at the same date of Canino and Charisma of apricot cultivars grown at TADCO. Very few fruits were harvested on May 19, 2012.
vi. Some suckers (1-3)/ tree appeared at the rootstock. viii. The quality parameters for Pink Cot fruits are shown in the quality Table 12. The average dates for blooming & fruit setting of stone fruits under study was week 8 to week 13 during the period Feb 19 – March 26. Spring frost occurred on March 18 in 2010 and March 19 in 2012 caused damage to the flowers in the form of dry flowers as shown in Figure 24 which affected fruit setting by killing the fruit embryo, and therefore affected the productivity of the damaged cultivars. Figure 24: Dry Plum flowers caused by the frost in March 19, 2012. When the spring frost occurred in March19, 2012, some of the stone fruit cultivars did not reach 100% blooming like Lady Red and Ruby Red (cross-pollinated cultivars) as they reached complete flowering on March 26 two weeks after the full bloom of the pollinators. This delay in blooming had caused a serious pollination problem to these cultivars. Some cultivars were not with homogenous flowering like Lady Red & Pioneer, and this gave them chance to escape partially the frost damage. Figure 25: (A) Thrips Damage on the fruits of Black Splendor Plums and (B) on the fruits of Ruby Sweet Nectarines. 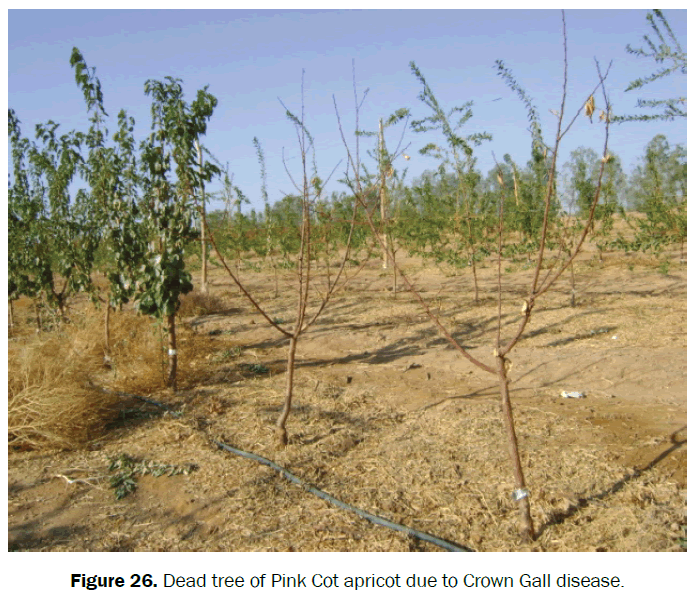 Figure 26: Dead tree of Pink Cot apricot due to Crown Gall disease. Plums cultivars: Black Splendor & Pioneer. Nectarines: Mesembrane, Royal Gem, Ruby Sweet. We observed misshape on the fruits of Royal Gem Nectarines (Twin Fruits) which apparently was due to poor pollination, and it could be caused by physical injury of frost or pests and diseases (Figure 27). Figure 27: Twin fruits on Royal Gem Nectarine. Figure 28: Plum trees cultivars bearing fruits: (A) Black Splendor, (B) Gamonal and (C) Pioneer on May 23, 2013. 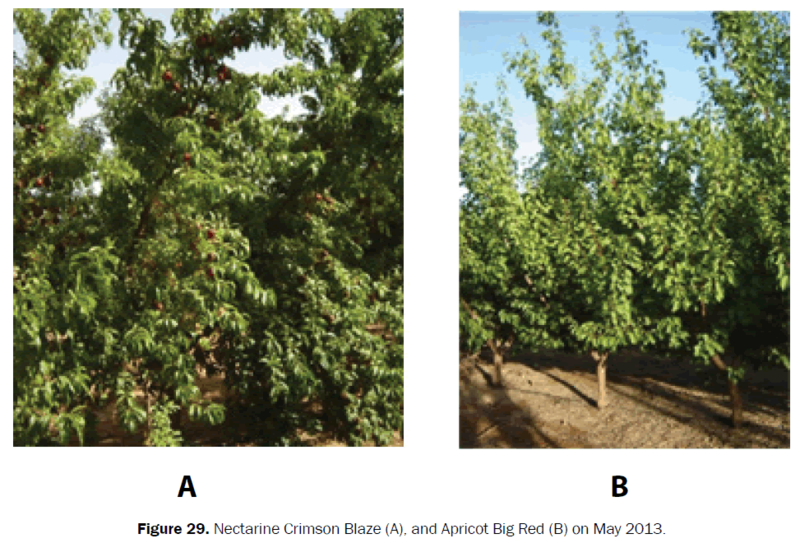 Figure 29: Nectarine Crimson Blaze (A), and Apricot Big Red (B) on May 2013. Table 19. Summary on the various stone fruits cultivars/root stock combinations in relation to tree growth size, height, bearing fruits and the root stock suckers. Field observations had shown vigorous trees growth, high yield and high quality of some cultivars under the influence of the selected rootstocks, good preparation of the soil after the deep ripping and reclamation of soil by the addition of gypsum and sulfuric acid before planting. Research unit personnel observed in the 2011 season the start of production on the cultivars planted in the 2009, and in the 2012 season for the cultivars planted in 2010. The productivity of the different cultivars ranged from season to season based on: the number of chilling hours, the occurrence of frost damage in the 2012 spring season, and the nature of the cultivar if it was self-pollinated as in the peach, nectarine and some plum cultivars or they need to be pollinated, like most plum cultivars and French apricot cultivars. Presumably most of the rootstocks used with the cultivars were early to medium maturity with low to medium chilling hours requirements. The Productivity of fruit trees cultivars were affected in 2012 due to frost on March 19, but in 2013 season productivity of most TADCO stone fruit cultivars were with good fruits bearing. Most of the cultivars in the experimental area were with good load in 2012 & very good load in 2013. So, the cultivars of Plum, Nectarine, and Apricot which bear little fruits in 2012 and no fruits in 2013 were not suitable for TADCO due to the fact they need longer period of chilling hours [14,15] as per the results shown in Tables 20 and 21. Table 20. Summary results for the productivity of selected stone fruits cultivars in two cropping seasons. Table 21. Analysis of soil samples taken from orchard (4) on January 10, 2005. The average dates for blooming & fruit setting of stone fruits under study was week 8 to week 13 during the period Feb 19 – March 26. Spring frost occurred on March 19 in 2012; this caused damage to the flowers in the form of dry flowers and affected fruit setting by killing the fruit embryo, and therefore affecting the productivity of the damaged cultivars. When the spring frost occurred on March 19, 2012, some of the stone fruit cultivars did not reach 100% blooming like Lady Red and Ruby Red (crosspollinated cultivars) and they reached complete flowering on March 26 two weeks after the full bloom of the pollinators. This delay in blooming had caused a serious pollination problem to these cultivars. Some cultivars were not with homogenous flowering like Lady Red & Pioneer, and this apparently allowed them to partially escape the frost damage. Invasion of flower thrips Frankliniella occidentalis during blooming & fruit setting affected productivity . The insects feed and lay eggs into the buds, blossoms and small fruits in early spring leading to the formation of corky scars on the fruits surface which lowers the quality of the fruits. Thrips caused serious damage on the fruits of Black Splendor & Pioneer plum cultivars and on the fruits of Mesembrane, Royal Gem, Ruby Sweet nectarine cultivars. The misshape of Royal Gem Nectarine fruits (Twin Fruits) was apparently due to poor pollination. Plum cultivar Black Splendor: Established by the US Department of Agriculture, self-pollinating and with low chilling hours requirements, early production and high productivity, with an average of 20 kg per tree. The color of the fruit is blackish blue and the color of the flesh is red similar to the color of the beet root. It is useful for fighting cancer in the human body because it contains high levels of antioxidants such as blackberry, and its taste is good with the presence of light acidity. Plum cultivar Pioneer: South African origin, self-pollinating with low chilling hours requirements and early production, and the productivity was good with an average of 11.6 kg/tree and the taste is wonderful. The color of the fruit is yellow, with slight redness on a part of the fruit. It is the pollinator for Gamonal plum cultivar. Nectarine Crimson Blaze is a South African cultivar, self-pollinating, low-chilling hours requirements, it is with medium maturity date by the mid of May with high productivity of 29.5 kg/tree. Its taste is acceptable, with about 9% of total soluble solids. The color of the fruit is bluish red with a slight redness on the part of the fruit. Nectarine Royal Gem: South African origin, self-pollinating, low chilling hours requirements with medium maturity date by mid of May, had a good yield of 14.9 kg/tree good taste with about 14% total soluble solids. The color of the fruit is bluish red with a slight redness on the part of the fruit. The apricot cultivars produced small amounts of fruits in the seasons of 2011 and 2012, and only Big Red cultivar produced 5.5 kg/tree in the 2013 season. Therefore, they were not suitable for the Tabuk region apparently due to their need for high chilling hours and need for Tom Cot pollinator. The company has successful apricot alternatives cultivars such as the early maturing cultivar A-35. For the flat type peaches and nectarine cultivars, they did not produce satisfactory yield due to high chilling hours requirements. It had been noted that most of the selected rootstocks for the stone fruits cultivars were suitable in the calcareous alkaline salty soil except Mariana rootstock as we observed decline of the cultivars budded on this rootstock: twelve trees (40%) of Black Splendor plum cultivar were died, and five trees (16%) of Alba plum cultivar. Most of the rootstocks encouraged trees growth and did not reduce the size of the trees of the different cultivars to fit the super high density planting with the main leader system or the open center system. So, search for dwarfing rootstock  for super high density planting is needed. Some cultivars had shown incompatibility with the selected rootstock: Four plum trees of Gamonal cultivar shown incompatibility of the scion with the rootstock GF 8-1, and one nectarine tree of the cultivar Ruby sweet shown incompatibility with GXN 15 (Garnem) rootstock. i. Black Splendor Plum & Gamonal plum shown gum exudates at the trunk base of the tree. ii. High gum exudates on the trunk and major branches of Pioneer Plum. iii. Some gum exudates on the trunk and major branches of Ruby Red plum. 1. One Black Splendor Plum tree at the trunk base of the tree. 2. Two Pink Cot Apricot trees at the trunk base of each tree. 1. Ruby Red Plum as harvesting started on July 16, 2011. 2. Alpa plum as harvesting started on August 23, 2011. 3. Crimson Blaze Nectarine as harvesting started in the mid of May one month after the harvesting date of Viowhite and with low % TSS range 8 – 10. So far, we did not observe any infestation with root knot nematodes as all the rootstocks were resistant to these nematodes. Also, we did not observe any type of yellowing or chlorosis as most of the rootstocks were tolerant to calcareous soil. 1. We recommended growing Black Splendor plum & Pioneer plum in larger areas at TADCO. 2. We recommended growing Crimson Blaze & Royal Gem nectarine in larger areas at TADCO. 3. We recommended increasing the spacing between the trees of the selected cultivars of Stone fruit cultivars to be 2.5 – 3 meters under Super High density system with the same rootstock used in the trial and search for dwarfing cultivars for 1.5 meter trees spacing. The authors wish to thank TADCO CEO, Eng’r Saad Al Swat, Eng’r Saeed Al Omer, and Dr Abdul Monim Ali for their continuous support during this study. We also extend our sincere thanks to Orchard 2 Supervisor and Operation personnel whom carried out the daily operations work. We extend our thanks to Mr. Hamada Tolba, Quality Control Supervisor, TADCO Laboratory staff: Mr. Conrad Angeles, Abu Kashem for the soil and tissue samples analysis, and Isaac Obra for arranging the chilling hours reports. Hoying SA and Robinson TL. Pruning high density peaches for yield and fruit quality. Cornell University Cooperative Extension, Hudson Valley Lab, Highland New York, 1999. Miles NW, et al. High density peach production in Ontario. N Y Fruit Quart. 1999;7:1-5. Reighard GL. Stone fruit rootstocks: current status and overview for the future. N Y Fruit Quart. 2005;13:21-24. Kader AA and Mitchel FG. Maturity and quality in: peaches, plums and nectarines growing and handling for fresh market. University of California, Division of Agriculture & Natural Resources Publications. 1989;25:191-196. Mitchel FG, et al. Postharvest quality in fresh market stone fruits. University of California, Davis, 1995. LaRue JH and Johnson RS. Peaches, plums and nectarines: growing and handling for fresh Market. University of California, Division of Agriculture & Natural Resources Publications. 1989;p:246. Ogawa JM, et al. Compendium of stone fruit disease. The American Phytopathological Society, USA. 1995;p:98. Strand LL and Flint ML. Integrated pest management for stone fruits. University of California Publications. 1999;p:264.